Brian Tolle, Outgrown, 2009, toys, and platinum silicon rubber, 58 X 40 X 80 inches. Brian Tolle’s work, Levittown, offers us a creative glimpse behind the repetitive uniformity of the American dream home. Designed and built by Abraham Levitt and his firm Levitt & Sons between 1947 and 1951, the Long Island planned housing community, Levittown, received praise from some but also came under scrutiny for its uniformity and mass produced nature. One of the earliest examples of functional prefabricated housing and often identified as the first proper suburb, Levittown has come to represent suburban Americana and the stereotypical, postwar, American dream community. Tolle has created soft silicone sculptures and combined them with other objects. His combinations reference the struggle between conformity and individual identity; they offer elements of Levittown’s uniformity with markers of individuality and identity from its presupposed inhabitants. The meticulously crafted silicone skins (or soft sculptures) resemble scaled down versions of the Levittown houses. They have all been created with the same mold, bear the architectural details of the original houses and are identical, save their color. Tolle has arranged these pliable rubber skins with other objects in order to infuse some life into their deflated state. 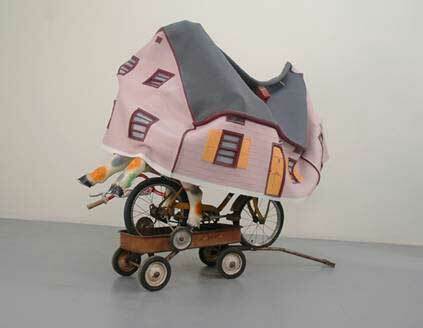 The objects, which include a rocking chair, an ironing board, a bicycle, a wagon, sports equipment, tire swing, etc. either support the rubber skins from underneath or help to suspend them. For example, on a small square of AstroTurf, Tolle stuffs a royal blue rubber house skin with sports memorabilia and ties it up with a string, recalling a mesh sports bag. These objects represent the identity and spirit of the people of Levittown; they support their houses and literally give them shape and life, just as a house is not a home without the people in it. His work is full of symbolism as he toys with the delicate relationship between American issues of conformity (as expressed through the identical houses) and the individual identities of the occupants. Ultimately, I would describe Levittown as cerebral, thought provoking and visually engaging without being too serious or overwhelming. The exhibit interests viewers with its own distinct personality. References concerning broader, more familiar topics such as prefabricated architecture, (an increasingly popular topic in contemporary architecture and in publications such as Dwell Magazine) and the pressure to conform to society while retaining a bit of individualism bring this exhibit to both intellectual and personal levels. To see more of Brian Tolle’s work check out the Irish Hunger Memorial in Battery Park City, Stronghold at the University of Washington in Seattle or the installation at the New School, where he is a member of the faculty. His upcoming projects include a sculptural project to be installed at the entrance of the Manhattan Bridge in Brooklyn in 2009.